This is project report on "Wind turbine electricity generation". This project emphasis on use of wind energy as fuel and to generate electricity using it. In wind-electric turbine, the turbine blades are designed to capture the kinetic energy in wind. The rest is nearly identical to a hydroelectric setup: When the turbine blades capture wind energy and start moving, they spin a shaft that leads from the hub of the rotor to a generator. 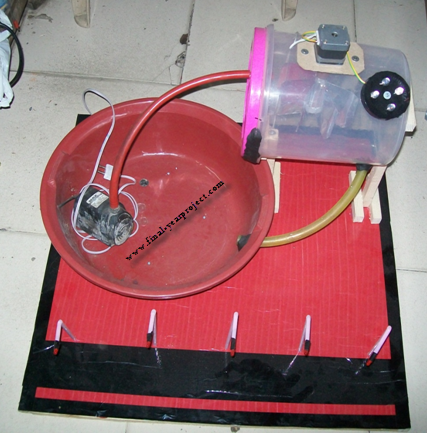 The generator turns that rotational energy into electricity. At its essence, generating electricity from the wind is all about transferring energy from one medium to another. You can also Subscribe to FINAL YEAR PROJECT'S by Email for more such projects and seminar. 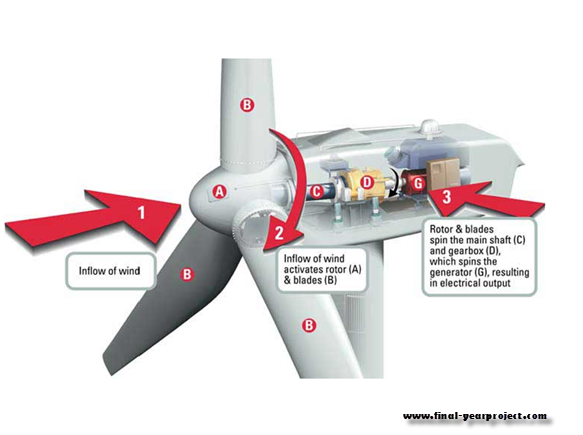 Simplest possible wind-energy turbine consists of three crucial parts viz : Rotor blades, Shaft & Generator. All this parts are very important and play a very crucial role in electricity generation. Now with the modern technology, Engineers has developed two advance type of Wind turbine design based on horizontal-axis and vertical-axis. In Vertical-axis wind turbine a.k.a VAWT, the shaft is mounted on a vertical axis, perpendicular to the ground. As implied by the name, the HAWT shaft is mounted horizontally, parallel to the ground. HAWTs need to constantly align themselves with the wind using a yaw-adjustment mechanism. At present, wind turbines are currently generating about as much electricity as eight large nuclear power plants. And thus is the good source of energy. This project report includes complete working and design of Wind turbine with explanation. Use it for your reference and study work only.